Distal sclerite of male palp open along one side with second haematodocha extending almost to tip of embolus,cymbium of male palp with one lobe rounded,other acutely pointed, palpal tibia of males swollen and usually with an excavation prolaterally, bearing short, thorn-like spines usually arranged in a half-circle. spines usually arranged in a half-circle. Median ocular quadrangle usually wider posteriorly than anteriorly,anterior lateral eyes large,near clypeal edge,usually on tubercles-posterior row of eyes procurved-posterior lateral eyes usualy large and reniform orpear-shaped cheliceral furrow with a row of large teeth on inner row,auter row of teeth reduced or only a few small denticles posteriorly,labium broader than long with two pairs of small marginal siggila,coxa III with strips of rather slengs setae on posteroventral border,male palp as in fig.Body size 8-18mm. Raven (1985) placed the Idiopidae in the microorder Fornicephalae in the Rastelloidina with the Migidae, Actinopodidae and Ctenizidae. The Cyrtaucheniidae constitutes the sister group of the Idiopidae. Raven (1985) reviewed and redelimited the Idiopidae and provided a key to the genera. He transferred several genera previously placed in the Ctenizidae to the Idiopidae. 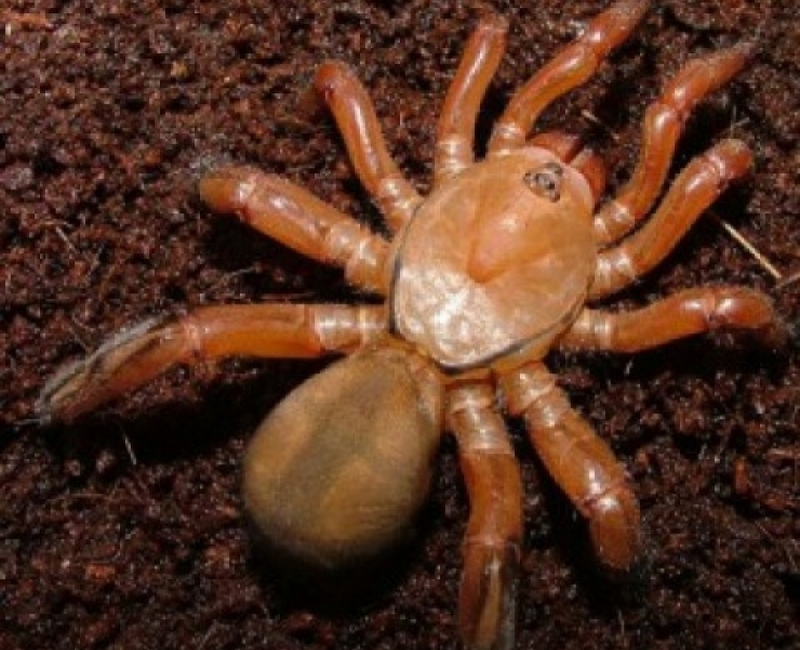 Idiopids are trapdoor spiders that use their rastellums to excavate burrows. They make their burrows in a variety of soil types, often on open grassy plains where the soil is soft during summer, enabling them to dig or enlarge their burrows before the soil hardens during the winter months. Acanthodon cregoei Purcell, 1902b: 352; Hewitt, 1919b: 75. Ctenolophus cregoei: Purcell, 1904: 119; Roewer, 1942: 149. Distribution: South Africa (KwaZulu-Natal: Durban). Ctenolophus fenoulheti Hewitt, 1913a: 414; Roewer, 1942: 149. (24.51S; 31.25E) in Mpumalanga Province). Distribution: South Africa (Mpumalanga: Newington). Acanthodon kolbei Purcell, 1902b: 353. Ctenolophus kolbei: Purcell, 1904: 118; Roewer, 1942: 150. Distribution: South Africa (Eastern Cape: Kentani). Ctenolophus oomi Hewitt, 1913a: 415. Acanthodon oomi: Hewitt, 1916b: 187; Roewer, 1942: 150. Morphological study of the Mygalomorph of trapdoor spiders of family idiopidae genus Ctenolophus and taxonomical knowlenge of the genus is still unsatisfactory.